Plus, Oralia's Kitchen moves and Off the Grid comes to Uptown Oakland. Standard Fare's saucy BBQ pork sandwich. West Berkeley's newest lunch option isn't a restaurant or a food truck, but a "curbside delivery" service operating during lunch hours. Standard Fare, the brainchild of former Chez Panisse chef Kelsie Kerr, is best known for its eco-friendly, ceramic-pot-packaged, bike-powered dinner delivery service, which launched in April. While the company waits for the City of Berkeley to approve its retail permit, and thanks to a new feature of the Square mobile payments processor — Standard Fare customers can now place a lunch order (and pay for it in advance) online or via mobile app, receive a text when their food is ready, and then pick it up at the company's commercial kitchen space at 2701 Eighth Street, where an employee will bring the bagged lunch to the curb. The whole process takes less than fifteen minutes. Standard Fare is currently offering lunch service Tuesday through Thursday, from 11 a.m. to 2:30 p.m. And while the company's dinner menu features more elaborate entrées, the lunches are of the grab-and-go variety — sandwiches, salads, and soups. Prices are $10 for the day's meat-centric sandwich offering, and $9.50 for the vegetarian option — not exactly inexpensive for a picnic-style sandwich that's served at room temperature, but the quality is on par with what you'll find at other Berkeley-based slingers of fancy sandwiches, such as Local Butcher Shop or Bartavelle. 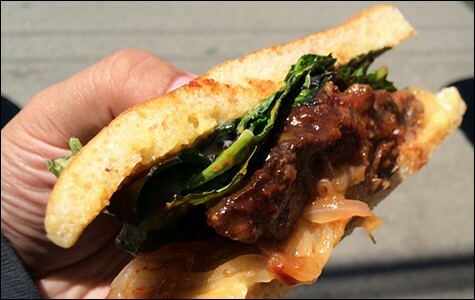 The BBQ pork sandwich was a little sloppy for curbside dining, but featured excellent house-baked focaccia, Magruder Ranch pork shoulder, and lush caramelized onions. Even better was the Arnold Palmer ($3.50), infused with Meyer lemon zest, and a bag of small double-chocolate-chip cookies ($3). The eventual plan is to offer walk-up retail service for both lunch and dinner at Standard Fare's corner space in the Berkeley Kitchens, dispensing with the need to order ahead online. However, the facility's retail permit is currently under appeal due to parking concerns raised by a neighboring developer. Kerr said she hopes the issue will be resolved by September — the online ordering and curbside delivery setup is basically a workaround until that happens. Because the building is only zoned for "incidental retail," only 10 percent of the space can be allocated for retail business — roughly 80 square feet, or just enough room for a small counter placed in front of a glass-door refrigerator. Humble as the setup will be, Kerr said she can't wait. "We want to serve the community — to really be part of it," she said. Even as some mobile food businesses transition to opening brick-and-mortar restaurants, the continued success of Off the Grid, noted organizer of massive food-truck gatherings in the Bay Area, offers convincing proof that the dining public has yet to tire of gourmet street food. Now, founder Matt Cohen is looking to tap into one of the East Bay's juiciest markets — Uptown Oakland. Elaborating on an initial report by Diablo Dish, Cohen confirmed that Off the Grid's newest event will be located near the Fox Theater, on William Street, adjacent to the Henry J. Kaiser Memorial Park. The new market will debut on Monday, July 14, from 5 to 9 p.m., and will take place every Monday night thereafter. A total of eight food vendors will be on hand the first week, and Cohen said there's room at the site to expand to as many as ten. 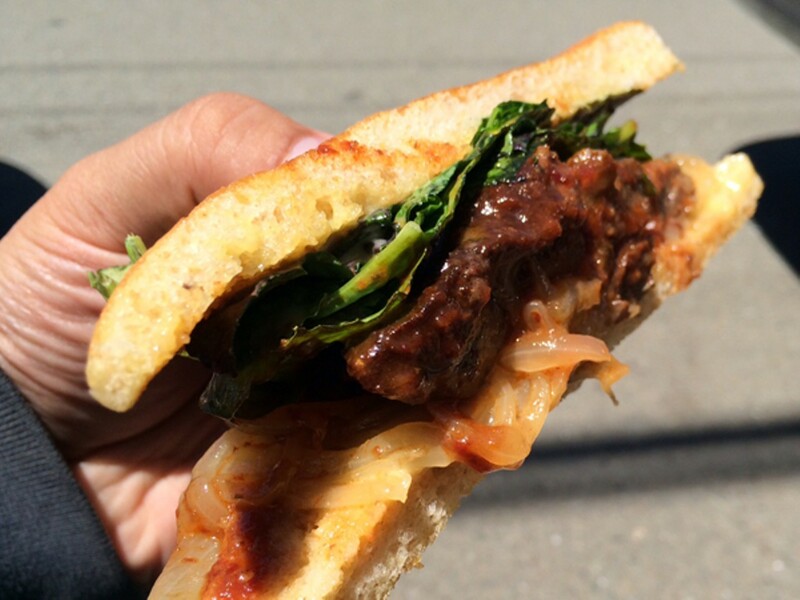 Off the Grid currently runs 34 weekly food truck events scattered throughout the Bay Area. The Uptown market will be its 35th. Oralia's Kitchen — a charming family-owned restaurant offering the rare trifecta of Salvadoran food, Mexican food, and Louisiana Fried Chicken — has moved farther up San Pablo Avenue from its original location, a former Louisiana Fried Chicken spot in El Cerrito. The restaurant now shares a kitchen with Angie's Bakery (12889 San Pablo Ave., Richmond), a Guatemalan and Salvadoran bakery with a cavernous seating area that had been mostly unused prior to this collaboration. Co-owner Jose Hernandez told What the Fork that the move was prompted by a rent increase and the business's ongoing inability to secure permission from the city to replace the "Louisiana Fried Chicken" sign outside of the restaurant. The bad news: The owners are still working on securing the necessary permits and equipment needed to cook in the new space, so for now they're only offering a stripped-down deli menu of bagels, sandwiches, tortas, fresh juices, and smoothies. However, Hernandez hopes that within the next few weeks, Oralia's will be able to bring back its full menu — not just the tacos, pupusas, and empanadas, but also the restaurant's greatest fusion creation: the Louisiana Fried Chicken-inspired Fried "Chickurrito."